I have these blocks sewn up and stuck to my design wall (a.k.a. a piece of flannel…classy). 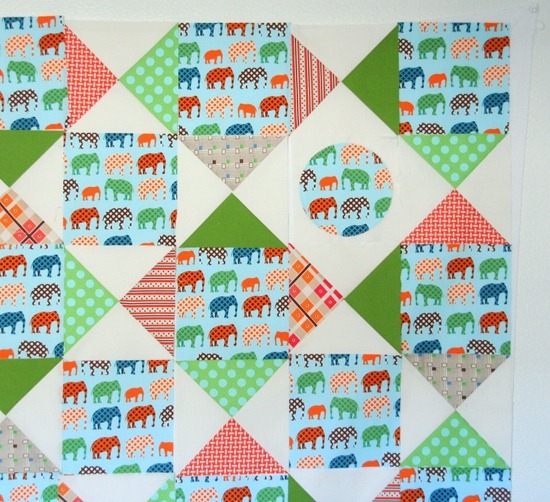 After I was finished sewing up all the blocks and feeling all great about my quick quilt…I realized I had sewn 19 extra hourglass blocks, and cut 10 too few elephant blocks. How in the heck I did that I have no idea…and to top it off I had just used up the rest of the elephant fabric making bean bags that my son will throw at me. I, also, have flannel stapled to my wall and it works just great! It looks great, even with the miscalculations. That's always the thing I count and recount and recount. 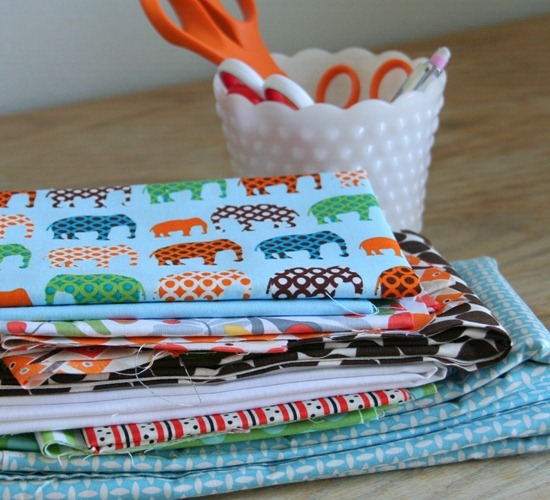 Otherwise you wind up with a baby quilt of your extras! This is really cute! I like the circles too. :) And I really need to make some bean bags for my kiddos too. Yup…just put it on "the list". Good for you! You took an oops! moment and turned it into a design opportunity! Quilt really is very cute! My design wall is super classy! It is a flannel backed tablecloth I picked up for $5 on clearance sale at Target! Does the trick, and I'd rather spend my sewing budget on fabric! Oh my gosh I love it!! And I don't even have a designe wall set up yet so your piece of flannel is super classy to me!! ;-) I'm loving the idea from the follower above me "Staci" to use a cheapo vinyl table cloth! I think it looks very cute!!! I have done the miscalculation I dont know how many times, even when I am staring at the pattern, lol!! I like it a lot. I've been using the floor as a design board :) I need to rearrange and clean my sewing room. Someday!! I love the design change!! It "adds interest"!! And if a little someone is going to be throwing bean bags at you, you might want to consider the blog name…Duck, Duck, Sew!!! LOL!!! Praying for you to have some rest. Haha to KT above, about "duck, duck, sew." Funny. Anyway, the fabrics you used in the quilt are awesome together. And you just made a series of great "design decisions." Add me to the Klassy Design Wall Klub (flannel backed vinyl tablecloth). Love your design "mistake" – you definitely worked it! Yep flannel backed tablecloth here too. Purchased by the yard at a local fabric store. I l-o-v-e it! And the quilt is lovely! Nice save… and I love the milk glass! Oh, and I juse re-did my sewing room to include my first design wall… out of flannel. Hey, if it ain't broke, don't fix it! Thanks for the tip about the tablecloth, everyone, or flannel, I use the floor and my knees don't cope anymore! Gorgeous blocks as well. ok am i the first to ask …. what is the elephant fabric? i love it!! That is such a fun print, love all the colors you choose. i love the elephant fabric, it looks perfect for a boy. I also use a flannel for my design wall and love it! Awww SewSara beat me to it…. where did you get this gorgeous fabric I love it and must have it immediately!!! What a gorgeous "mistake" you are very talented. So cute! And I am in awe of your "no waste" plans with fabric! You are brave! It happens to me ALL the time – from the planning, during the piecing and towards the end. I scored in high maths – calculus, algebra, etc but failed in the ordinary statistics. I need to sleep off the week – next step is cutting and I don't trust myself now. Ha! My design wall is flannel material tacked over my closet door :) Save your money for the good stuff like elephant fabric! The quilt is so cute! Love the colors! So cute! Would you mind telling me what fabric line that is? I love it! As I always tell my students a mistake is a beuatiful picture waiting to happen…same can be said about quilts.